Caffeine is the world’s most commonly abused brain stimulant. Daily caffeine consumption by adolescents (ages 9-17 years) has been rapidly increasing most often in the form of soda, energy drinks, and coffee. A few years ago, a pair of studies documented that caffeine consumption in young adults directly correlated with increased illicit drug use and generally riskier behaviors. However, these correlational studies never examined the long-term consequences of caffeine consumption, i.e. does long-term coffee consumption during adolescence lead to riskier behaviors during adulthood? How might caffeine consumption produce such long-lasting changes? The answer lies in understanding the actions of caffeine in the brain. In adults, caffeine appears to indirectly enhance the activity of dopamine within the brain’s pleasure centers. Drinking coffee produces a mild euphoria due to this effect and encourages the brain to crave more coffee. Yes, coffee is addicting, but only mildly so as compared to many other drugs of abuse such as tobacco and cocaine. The adolescent brain responds differently to caffeine as compared to the adult brain. Caffeine produces a more dramatic increase in motor activity in adolescents. In addition, long-term caffeine consumption produces more tolerance faster as compared to adults, suggesting that caffeine might produce greater changes in brain chemistry in the developing adolescent brain. This speculation was strengthened by the finding that long-term caffeine consumption during adolescence leads to greater sensitivity to amphetamine-like drugs that are used to treat attention deficit hyperactivity disorders. Fortunately, there is no current evidence that caffeine consumption leads to attention deficit hyperactivity disorders in children. A recent study, published in January 2015 in the journal Neuropsychopharmacology by neuroscientists at the University of Colorado at Boulder, investigated whether long-term caffeine consumption during adolescence could enhance the sensitivity of the adult brain to cocaine. They reported that adolescent caffeine exposure heightens the sensitivity to cocaine-induced euphoria and related behaviors via its parallel actions on dopamine in the brain’s pleasure center. Adolescent consumption of caffeine actually altered the brain’s neurochemistry so that the adult brain’s response to cocaine was enhanced. Interestingly, consuming caffeine as an adult for the same length of time didn’t produce the same type of behavioral or neurochemical alterations. This finding suggests that the developing adolescent brain is vulnerable to the effects of caffeine on dopamine signaling and that these changes can linger into adulthood and influence the abuse potential of euphoria-producing drugs such as cocaine. By any definition, caffeine is clearly a gateway drug. Is caffeine a drug or a food? Sometimes it is very hard to tell the difference. Featured image credit: Coffee. Photo by Petr Kratochvil. Public domain via Wikimedia Commons. Gary L. Wenk, Ph.D. is a Professor of Psychology & Neuroscience & Molecular Virology, Immunology and Medical Genetics at the Ohio State University and Medical Center, a Fellow by the American Association for the Advancement of Science for distinguished contributions in the field of neuropharmacology, neurodegenerative diseases and neuroinflammatory processes and the author of Your Brain on Food: How chemicals control your thoughts and feeling, Second Edition (Oxford University Press). 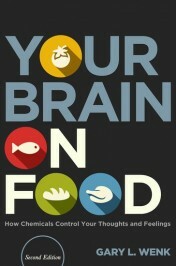 Additional insights into the actions of food on the brain can be found in Gary L. Wenk's TED talk: The Brain Café.